One thing I loved about my house the moment I saw it was the bright red front door. You have to love such a brave color. The outside of my house is dark brown and it's hidden in a front yard with a lot of trees, so I love how this door really helps keep the house from fading into the background. Last summer I ordered the vinyl numbers from an etsy shop that's now closed, and I looove them. They were really easy to apply, even for a non-user of vinyl such as myself. The wreath was actually a free gift from a consultant of a home decor company when I had a party a few years ago... can't beat free, right? 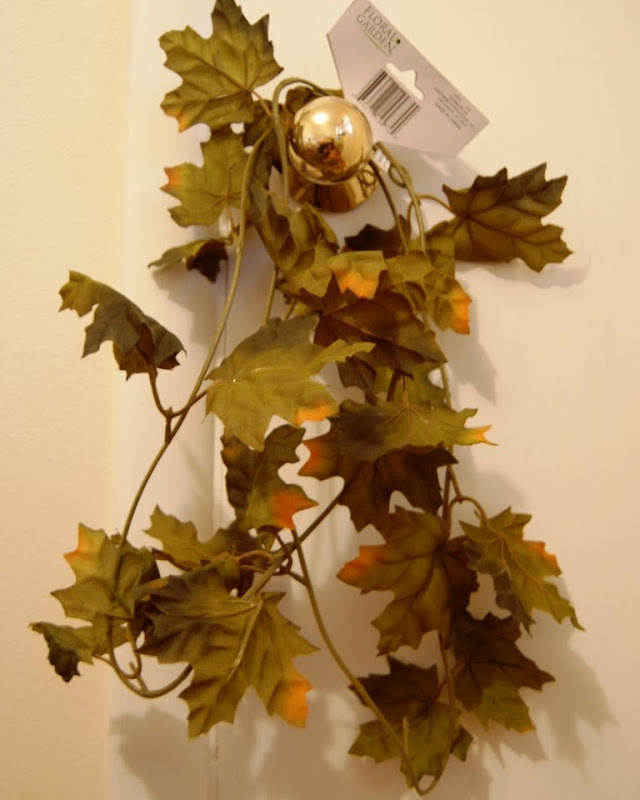 The wreath "holder" is actually a scrap of brown material left over from a pillow I made. I just sewed it in into a tube (for lack of a better word) to hide the raw edges, and used a couple flat thumb tacks to attach it to the top of my wood door. For a free, 10-minute project I love how it looks! 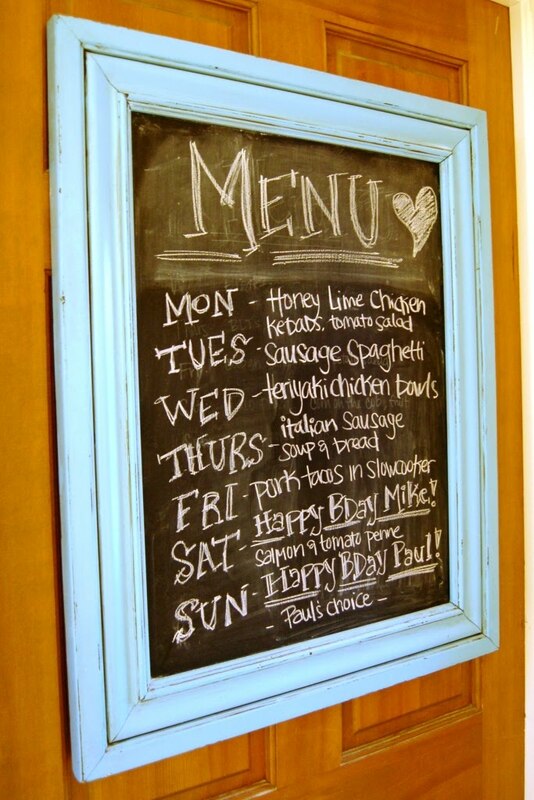 I always get compliments on this chalkboard, which I use for a menu in my kitchen. 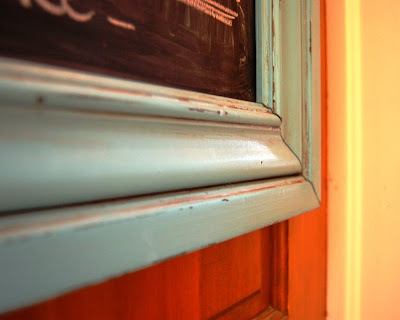 So I've decided to show you how I made it and finished the frame to give it a new, cuter life! And if by beauty you know I meant "cheap $1 garland that is NOT so pretty" then we're on the same page. I actually picked this particular garland because the leaves were a little sturdier feeling than a lot of the cheaper garlands with flimsy, nylony leaves. I can't wait to show you both of these projects! #1-- Love the RED door. 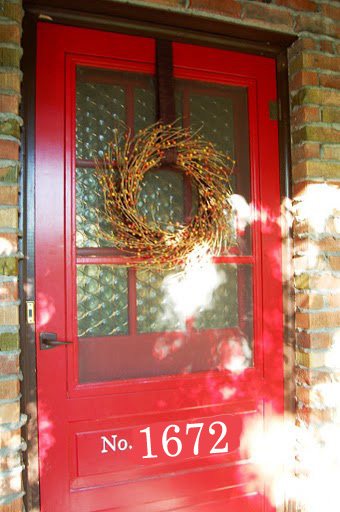 We live in a brick house as well, and I'm really considering taking a leap and doing our door red. Right now, it's nothing--never been painting because I couldn't commit to something bright. I wasn't sure I'd love it. But I love yours and I'm really really thinking I might do it! #2---I love your chalkboard! Make sure you share the details of it! 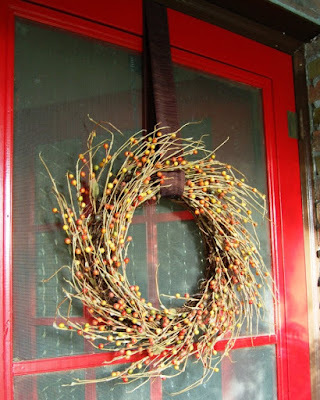 #3---Can't wait to see what you do with dollar store garland! I bought some today!!! You should post a picture of your house and get everybody's opinion! Unless, of course, you like to make your own decisions. I am the worst decision maker EVER!! 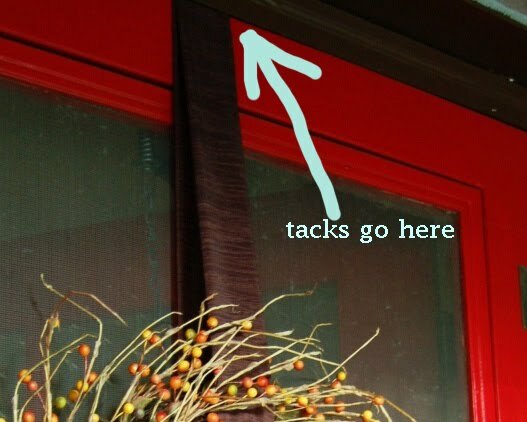 Red is fun, you just have to make sure the tone complements the other colors on your house. Erica....Paint is not a commitment. The lovely thing about it is if you don't like it you can paint over it, for cheap! I vote paint, just make sure you get the right tone of red for your house...or green....or purple...or just go black. I happen to know someone who loves to paint.....for margarita's she may just paint it for you. Of course anna, this means that you will have to back away from your own paint cans for just a minute, which could cause you great anxiety so I think margaritas are in order...or perhaps spiced hard cider. I feel a chill in the air. I love your weekly menu just as much as your chalkboard (if not more). I did that for a while -- with a much less chick dry erase board on the fridge -- but coming up with a week's worth of meals was somehow too much work. Apparently more than getting home at 5:25, figuring out what to cook and having it cooked by 6 p.m.